You are currently browsing the tag archive for the ‘gigantic’ tag. 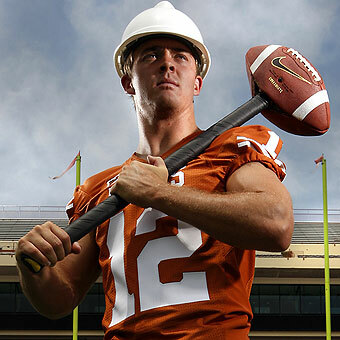 So instead of “normal” NFL gifts (Lambos, Porches, Hummers, etc…) – Colt has played his Cleveland-blue-collar-worker card well. Here we go Brownies..Here we go! 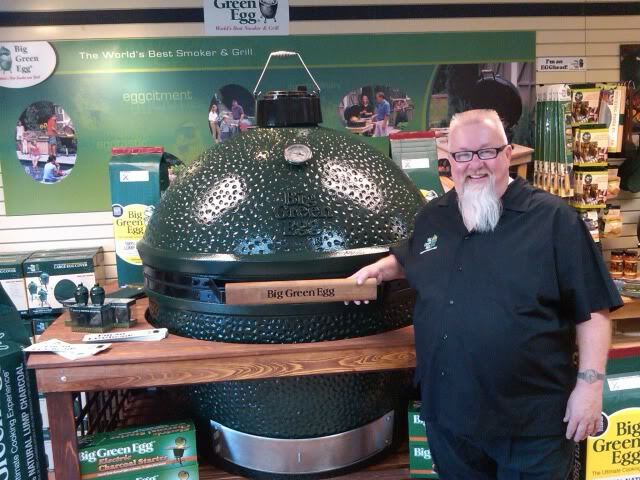 He has gifted his entire Cleveland Browns linemen a Big Green Egg, accessories, and a bag of charcoal. In my book, Colt just jumped up two spots. As we all know, the gift of food…more specifically the Big Green Egg is definitely a solid purchase/gift. We should know, we have one and love ours thanks to The Glenview Ave Bakery and Krausx2NYC. 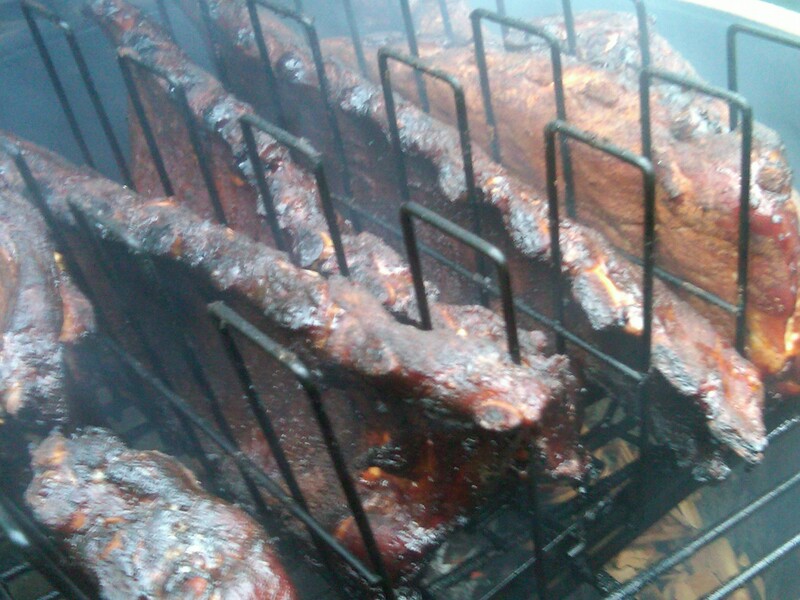 Our recipe for Keawe wood smoked ribs can be found here. Our recipe for “Just like Disneyland Gigantic Smoked Turkey Legs” can be found here. Maybe all the Browns can get a part-time job at the new Michael Symon restie upcoming . @chefsymon would hire them. Let’s talk about something as simple as wasabi. 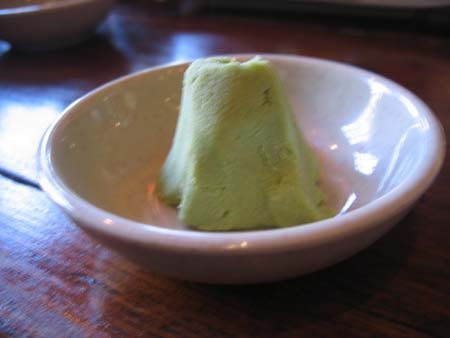 Most restaurants blob on this ridiculously gigantic lump of wasabi in the middle of your shoyu dish or soy sauce plate. 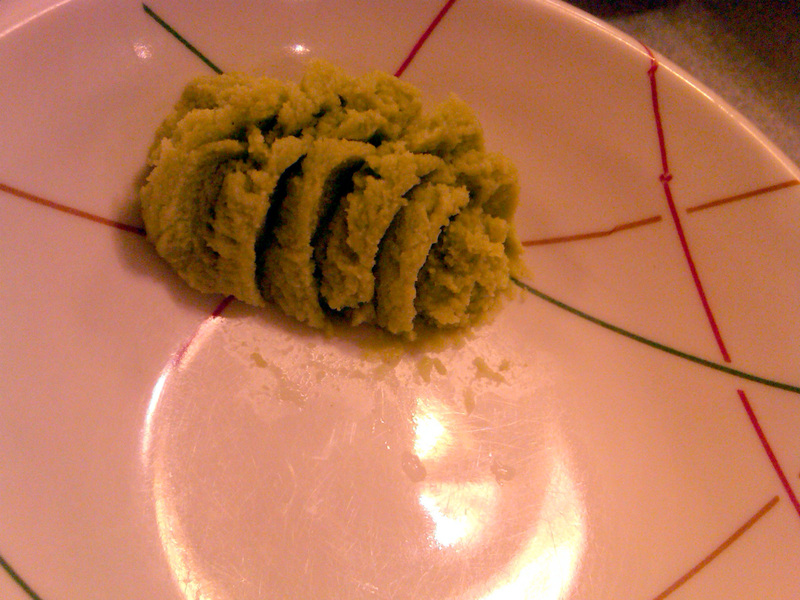 Wasabi should not look like a large crusty unnatural booger. C’mon peeps. 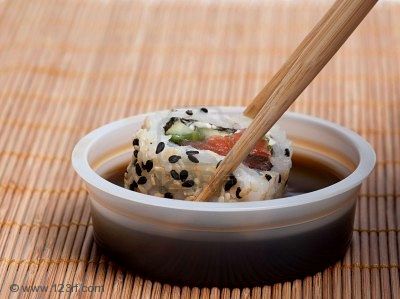 You go through all this work in prepping your sushi and making it nice and visually appealing to your patrons. Maybe for 2011, you ought to look at your other stuff too…like your supportive dishes. Because something so small, to me, really does make a difference. Personally, I like it when the wasabi is presented like a caterpillar on the outskirts of the dish because it looks organized, conformist and measurable (nice work Gyotaku in Pearl City, Hawaii). 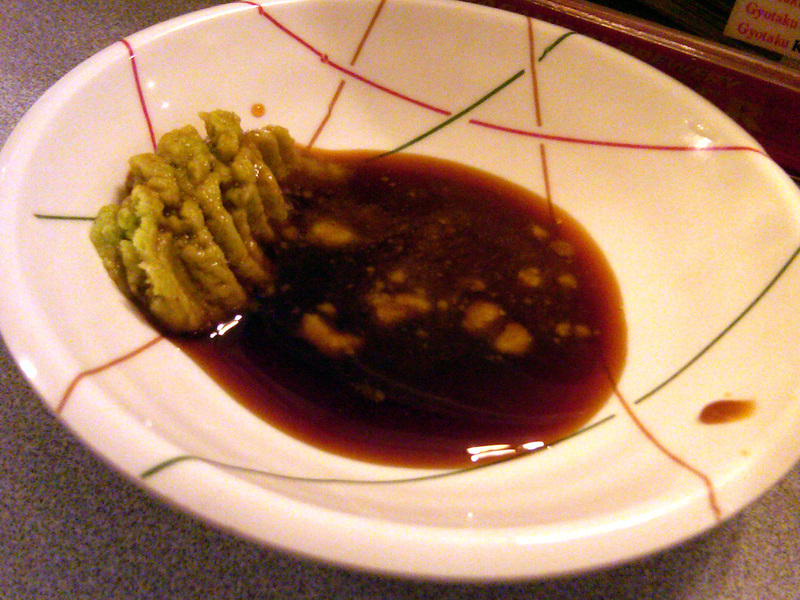 I can then titrate as much as I want without the rest of the wasabi getting involved like the creepy neighbor. Whether I need a hint of wasabi or a clean out my sinus portion-I can totally adjust the amount of wasabi I need. And patrons, try not to drown/submerge your sushi in it either. Let’s respect the food…and be dainty with sushi. Busy in the garden today…tending to the kids. 1. I do NOT like deer. 2. I do NOT like slugs. 4. The mint plant is hitting on my sister again! 5. And I think everyone has a different opinion about size. 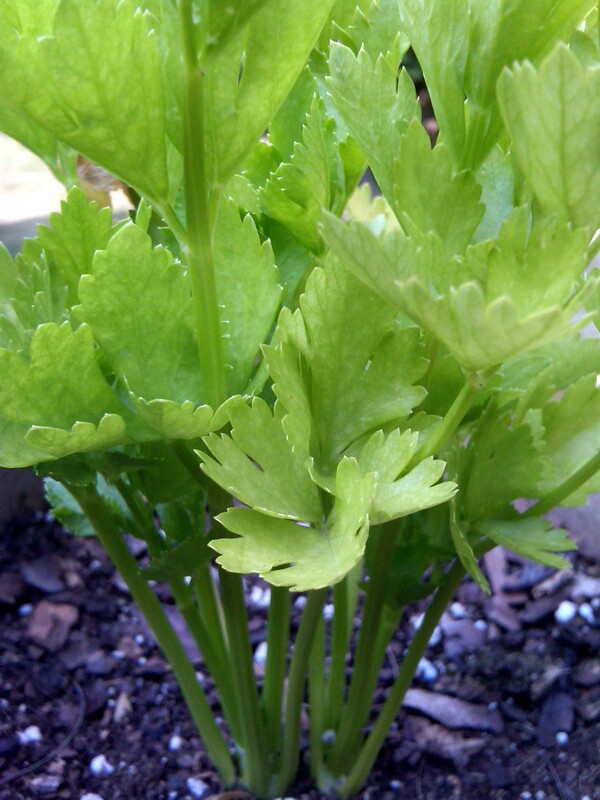 Proof pictured below is our “Gigantic Celery” from the Apiaceae family. Gigantic celery…it is not. On another unrelated note: QuarryLaneFarms will be closed for major construction/ renovations from 07/20 thru 07/25. And thanks for your patience.